Immediate payment of C $1,539.99 is required. Excellent product - heats/cools/drys. Silent! This product is incredibly quiet - both the indoor unit and the outdoor unit. 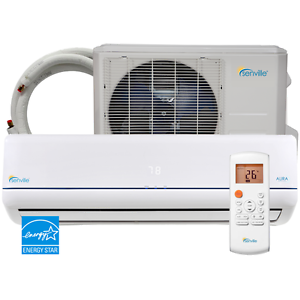 Unlike traditional air conditioners where the outdoor unit buzzes/vibrates and makes a fair amount of noise, this product is just about silent. Except for the weight, wall mounting is likely not an issue. Operation is quire simple and the remote is quite intuitive. I was also pleased to see that everything can be configured to display Celsius degrees. This build quality of both the indoor and outdoor unit is quite good. It is a bit of effort to install and you will need to hire an electrician and HVAC person to connect it correctly. If you do decide to install this yourself, please remember that you will need to pull a very deep vacuum on the lines. This cannot be done/measured with regular gauges - you'll need a digital gauge. Overall you'll need to invest another $300-700 for the vacuum pump, vacuum gauge, flaring tool, and nitrogen tank if going the DIY route. The only issue I ran into...and it's quite minor...is that the drain elbow for the outdoor unit is too tall to fit under the unit if installed on a concrete slab. This prevents you from redirecting condensation water produced by the outdoor (condenser) unit. I suspect this would be a non-issue if wall mounting. I would have given this heat changer 5 star but when I had purchased it.. it was under the impression that it was plug and play!! Surprise !! It has to be installed by a licensed technicien. Impossible to install yourself because of the équipement needed to turn on the Freon . It ended up costing another $500 to have the technicien connect everything and that is also the only way to get the guaranty! 21 Seer 18,000 BTU Mini Split AC with Heat Pump from SOGOODTOBUY on eBay! I bought this unit after buying a 12,000 BTU AC with Heat pump from SOGOODTOBUY and am so impressed with it. I have not used the AC yet but I wanted for the heat pump system. I have measured the 240 volt fed unit with a clamp on AMP meter and it is one third the use as the baseboard heaters they replace. My two mini split duct heat pump units are completely heating my home which is 2,000+ sq feet with it being 26 degrees tonight as I write this! It's a comfortable 72 degrees in my home. I recommend buying the 240 volt option with as high of SEER rating as you can get like this one is rated! This equals efficiency to your electric bill. The feed tubes are totally sealed as they enter your home. No air leaks like most AC units! Quiet operation using DC technology fan systems! You can even set it to oscillate the fan air for better heat distribution! I like the wall mount brackets to hang them on as they're out of the way. Search out the internet and eBay for the best info and pricing. Look for great Warranties too! The only negative are the instructions. I had to convert MM to inches. I think I could write the electrical wiring clearer. Well worth the install!